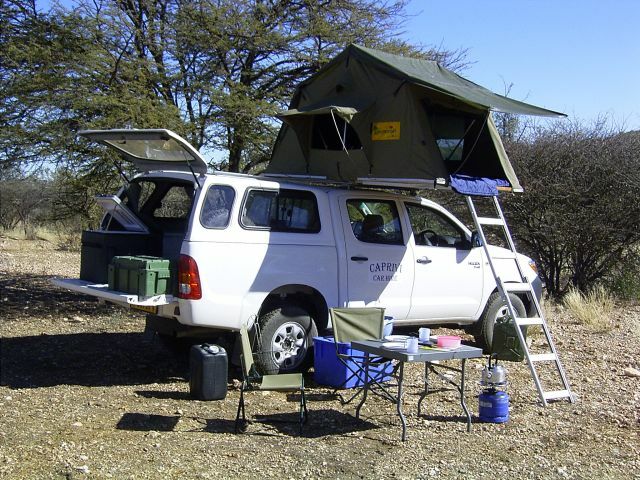 The Toyota Hilux Double Cab (4x4) is the ideal vehicle for a self-drive tour. This four-wheel-drive vehicle is suitable for all roads in southern Africa, even for the more challenging terrain. The car is designed for 4 people. The Bigger tyres offer more ground clearance than in normal passenger cars. This makes for a comfortable driving experience on travel roads and gives a better vantage point for animal viewing. The Toyota Hilux Double has a 150l double tank with an approximate range of 1300km. The Toyota Hilux Double Cab has a 6-speed manual transmission with a selectable four-wheel drive and a 2.4 Turbo Diesel 4-cylinder engine. The vehicle is equipped with power steering, ABS brakes, air conditioning, USB and a radio. Equipped with the following: 2 spare wheels, spade, jumper leads, tow rope, starter cables, broom and scoop, jack and wheel spanner. From the insurance point of view there are three maximum speeds on our roads: Maximum speeds are 60km/h in cities, 80km/h on gravel roads and 120km/h on tar roads. According to the insurance policy, these maximum speeds may not be exceeded. All vehicles are equipped with a satellite-aided tachograph. Please note: Caprivi Camper hire does not have a physical depot in this location, one way hires can be arranged to be collected or dropped off from Kasane. Please note: Caprivi Camper hire does not have a physical depot in this location, one way hires can be arranged to be collected or dropped off from Maun. Maputo Airport is a serviced non depot location. Please note: Caprivi Camper hire does not have a physical depot in this location, one way hires can be arranged to be collected or dropped off from Maputo. Epupa is a serviced non depot location. Please note: Caprivi Camper hire does not have a physical depot in this location, one way hires can be arranged to be collected or dropped off from Epupa. Gobabis is a serviced non depot location. Please note: Caprivi Camper hire does not have a physical depot in this location, one way hires can be arranged to be collected or dropped off from Gobabis. Grootfontein is a serviced non depot location. Please note: Caprivi Camper hire does not have a physical depot in this location, one way hires can be arranged to be collected or dropped off from Grootfontein. Katima Mulilo is a serviced non depot location. Please note: Caprivi Camper hire does not have a physical depot in this location, one way hires can be arranged to be collected or dropped off from Katima Mulilo. Keetmanshoop is a serviced non depot location. Please note: Caprivi Camper hire does not have a physical depot in this location, one way hires can be arranged to be collected or dropped off from Keetmanshoop. Luderitz is a serviced non depot location. Please note: Caprivi Camper hire does not have a physical depot in this location, one way hires can be arranged to be collected or dropped off from Luderitz. Namutoni is a serviced non depot location. Please note: Caprivi Camper hire does not have a physical depot in this location, one way hires can be arranged to be collected or dropped off from Namutoni. Okahandja is a serviced non depot location. Please note: Caprivi Camper hire does not have a physical depot in this location, one way hires can be arranged to be collected or dropped off from Okahandja. Okomitundu is a serviced non depot location. Please note: Caprivi Camper hire does not have a physical depot in this location, one way hires can be arranged to be collected or dropped off from Okomitundu. Omaruru is a serviced non depot location. Please note: Caprivi Camper hire does not have a physical depot in this location, one way hires can be arranged to be collected or dropped off from Omaruru. Ondangwa is a serviced non depot location. Please note: Caprivi Camper hire does not have a physical depot in this location, one way hires can be arranged to be collected or dropped off from Ondangwa. Opuwo is a serviced non depot location. Please note: Caprivi Camper hire does not have a physical depot in this location, one way hires can be arranged to be collected or dropped off from Opuwo. Oshakati is a serviced non depot location. Please note: Caprivi Camper hire does not have a physical depot in this location, one way hires can be arranged to be collected or dropped off from Oshakati. Otavi is a serviced non depot location. Please note: Caprivi Camper hire does not have a physical depot in this location, one way hires can be arranged to be collected or dropped off from Otavi. Otjiwarongo is a serviced non depot location. Please note: Caprivi Camper hire does not have a physical depot in this location, one way hires can be arranged to be collected or dropped off from Otjiwarongo. Palmwag is a serviced non depot location. Please note: Caprivi Camper hire does not have a physical depot in this location, one way hires can be arranged to be collected or dropped off from Palmwag. Rundu is a serviced non depot location. Please note: Caprivi Camper hire does not have a physical depot in this location, one way hires can be arranged to be collected or dropped off from Rundu. Sesriem is a serviced non depot location. Please note: Caprivi Camper hire does not have a physical depot in this location, one way hires can be arranged to be collected or dropped off from Sesriem. Please note: Caprivi Camper hire does not have a physical depot in this location, one way hires can be arranged to be collected or dropped off from Swakopmund. Tsumeb is a serviced non depot location. Please note: Caprivi Camper hire does not have a physical depot in this location, one way hires can be arranged to be collected or dropped off from Tsumeb. Please note: Caprivi Camper hire does not have a physical depot in this location, one way hires can be arranged to be collected or dropped off from Walvis Bay. Windhoek is a serviced non depot location. Saturdays & Sundays only by appointment. 31.12.2015 - we are open only for returns ! Saturday, Sunday, and Public Holidays, Vehicles are only handed over on appointment. 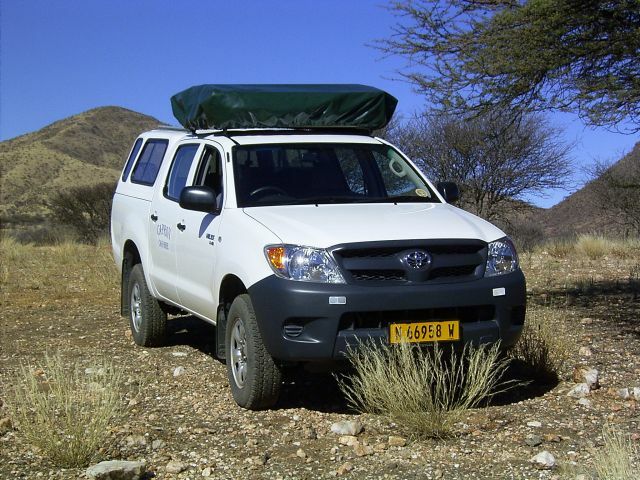 07h30 – 13h00 and 14h00 – 17h00 subject to the Transfer times as specified by Caprivi Car Hire / Africa on Wheels. Caprivi Car Hire / Africa on Wheels is not liable / responsible for clients arriving outside agreed appointment times. Clients will be provided with one free Transport from the International Airport to Windhoek, where such flights arrive no later than 19h00. Flights arriving after 19h00 will be charged as extra Transfer at a cost of N$480.00. We will meet you at Windhoek International Airport and shuttle you to our depot for processing of vehicle and paperwork. At the end of your rental you can also drop your vehicle off at any of our depots and we will shuttle you for free to the local Airport. Please give us your flight details if you have not done so when placing your original booking request. Windhoek International Airport is a serviced non depot location. 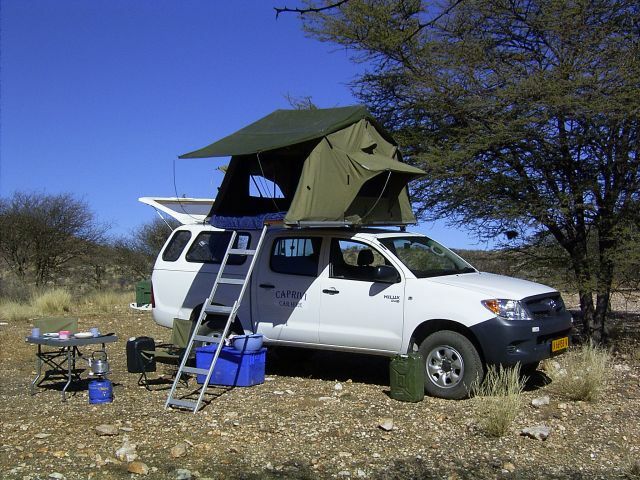 Please note: Caprivi Camper hire does not have a physical location at Windhoek International Airport. Caprivi offer a shuttle service from the airport to their branch where pick up, processing of vehicle and paperwork is completed. Johannesburg is a serviced non depot location. Please note that we do Rentals only by appointment, because our Office is temporarily closed. We will meet you at Johannesburg International Airport and shuttle you to our depot for processing of vehicle and paperwork. At the end of your rental you can also drop your vehicle off at any of our depots and we will shuttle you for free to the local Airport. Please give us your flight details, that we can arrange your transfer. Please note: Caprivi Camper hire does not have a physical location at Johannesburg International Airport. Caprivi offer a shuttle service from the airport to their branch where pick up, processing of vehicle and paperwork is completed. Please note: Caprivi Camper hire does not have a physical depot in this location, one way hires can be arranged to be collected or dropped off from Port Elizabeth. Upington is a serviced non depot location. Please note: Caprivi Camper hire does not have a physical depot in this location, one way hires can be arranged to be collected or dropped off from Upington. Dar Es Salaam is a serviced non depot location. Please note: Caprivi Camper hire does not have a physical depot in this location, one way hires can be arranged to be collected or dropped off from Livingstone. Lusaka is a serviced non depot location. Please note: Caprivi Camper hire does not have a physical depot in this location, one way hires can be arranged to be collected or dropped off from Lusaka. Please note: Caprivi Camper hire does not have a physical depot in this location, one way hires can be arranged to be collected or dropped off from Victoria Falls.